This 3 bedroom house is located in the Gran Vista complex, arguably the best private urbanization in the Gran Alacant area. 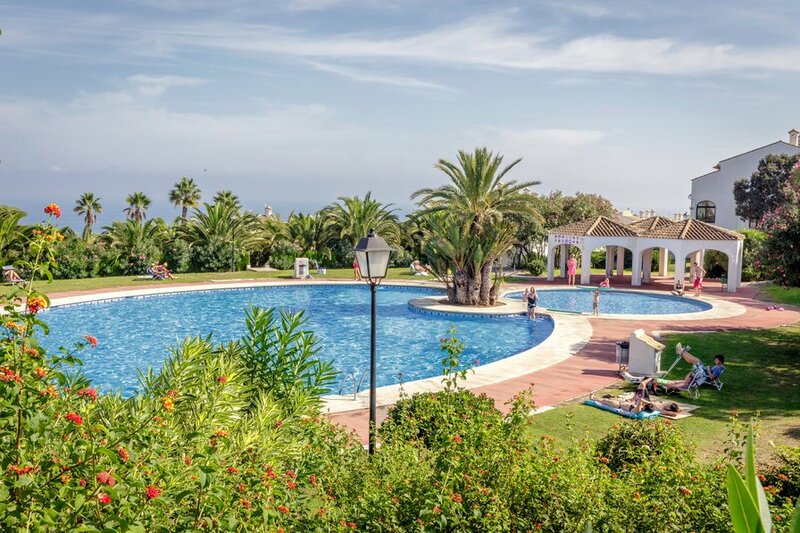 Nestling in the hills above Alicante Bay, this private complex has spectacular views over Carabasi beach and across to Alicante city and its castle (Castillo de Santa Barbara). The urbanization disposes of more than 30,000 m2 of garden grounds mapped out by small footpaths amidst the Olive and Palm trees. Nicely surrounded by green lawn you will find 4 swimming pools, (2 of which are for children), 2 tennis courts, a football playing area and playground for the young ones. The community has its own convenience store and restaurant/Coffee Shop. This stunning quiet community enclosed by separate entrance and exit gates benefits from 24 hours security (during summer) making a perfectly safe place for family holiday. This mid-terraced house is tastefully decorated, fully air conditioned and nicely furnished. It has three floors with the ground floor being the middle floor which is directly accessed by the front parking/patio area located in the font of the house. On the ground floor you find the Living room/Dining room, Kitchen and a full bathroom. The large lounge/dining area has all that you would expect from a living room 2 large sofas seating up to six people comfortably surround the coffee table and a dining table with six chairs. The room is fully equipped with TV/Video, DVD with (CD player option), Satellite receiver, and telephone (incoming calls only). A corner of this spacious room has been set aside as a work station with a desk. The fitted kitchen is fully equipped with Cooker/Oven/Extractor, full fridge/freezer, microwave/toaster slot, dishwasher, kettle, coffee maker and double sink. You will also find pots and pans, crockery, glasses and variety of kitchen utensils including cutlery. The fully equipped bathroom on this floor is fitted with a bath, shower, washbasin and bathroom furniture. On the first floor which is accessed via an interior set of stairs there is the master bedroom over looking the living area through a wooden banister. It has a large queen size extra comfort bed and bed side table, a built in wardrobe and a large chest of drawers. The lower floor can be accessed either via the stairs or via the back garden through the conservatory. It has 2 bedrooms, another fully fitted bathroom and a laundry & storage room. The second bedroom has 2 single beds which can be put together to make a double one, bedside table, 2 built in wardrobes and drawers/cupboard unit. From this room you can access the small conservatory and the garden. The third bedroom has a bunk bed unit with wardrobe making it ideal for 2 kids or young adults. The laundry & storage room has a washer/dryer machine, iron and a hairdryer. In general the house benefits from a lot of natural light due to its large windows. It should also be mentioned that the immediate large green area behind this house is often used by the near neighbors who set up sun loungers to sunbathe, making this a highly sought after property within the Gran Vista complex. A mere 5 miles from Alicante centre and one of the closest beaches to Gran Alacant (2min drive) is Los Arenales Del Sol. ‘Our photos don’t do it justice’ is the usual commentary of our guests. This typical Spanish seaside resort is the summer home of locals from nearby inland towns like Elche. Beach shops, bars and restaurants boasting stunning sea views line the recently extended promenade. This lovely beach runs into the gorgeous, dune backed Carabasi beach. And if you consider ‘white bits’ unflattering, then ‘bare all’ right here as part of the beach here is a nudist beach! On the other hand, I guess I can only say – ‘You’ve been warned!’ Further south and approaching the near by town of Santa Pola from the East, you will find further wonderful beaches and all within an easy and flat walk away from the shops, bars and restaurants. Amidst all the facilities and services in the area you will find supermarkets, banks (with cash dispensers), Video/DVD rental, car rental, petrol station and even a local street market. And although we hope you will not need them, you will find doctors surgery, pharmacy and opticians.